Montezuma is well-known in both the online casino gaming world and the land-based one. This popular slot has been designed and developed by WMS Gaming, and could arguably be one of the leading Aztec themed slot machine games on the net. It is based on Emperor Moctezuma, the ninth Emperor of Tenochtitlan, before he was captured and killed by the Spanish conquistador, Hernán Cortés during the Spanish conquest of Mexico. Of course, large parts of this slot deal with Aztec gold, rather than the Emperor himself. Aztec culture is represented, though. 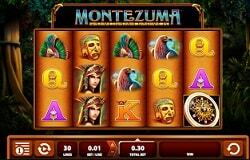 Montezuma is a WMS Gaming developed slot which has a fair few things in common with other slots from this developer. The wheel structure of the bonus rounds has been seen before. That isn’t necessarily a bad thing, though. After all, it does work rather swimmingly and has been proven popular with players in the past. Like most WMS developed slots, Montezuma was originally a tried and tested land-based casino game before it was ported over to the online casino world. WMS Gaming tends to favour simplistic wagering menu bars, and that is the route they have chosen to travel down with Montezuma. The slot features 30 non-adjustable paylines over its 5 reels, although players can later their bets from 1p up to £2. This will naturally see your total bets fluctuate from a base minimum of 30p per spin to a capped maximum stake of £60 a spin. Other options that the wagering menu bar has to offer, include a spin button, and access to the slot’s paytable. Wild symbols: The Aztec pyramid acts as a substitute symbol. As a wild icon, it can replace any other symbols in the Montezuma slot machine, save for feature icons. Wilds only appear on the three central reels, that means to say reels 2, 3 and 4. Feature symbols: Feature symbols are present as dials, or Aztec calendars. As their name suggests, these circular symbols can trigger a bonus feature when 3 or more appear on the reels in any position. Landing 3, 4 or 5 such symbols will also result in players pocketing scattered wins worth 3x, 10x, and another 10x their total bet. Free spin bonus: Montezuma’s feature is a free games bonus. Players will get to spin the wheel, in order to determine how many free spins they will be given. You could start the bonus with anything from 3 up to 25 free spins. At the start of each spin, a spin multiplier could be added to your wins, and these range from 2x up to 10x the value of the winning combination. Just two additional feature icons appearing on the reels will offer you further free spins. Montezuma has a RTP rate of 95.86%, and that is one of the more generous return to player rates you will find in a WMS Gaming developed slot machine. All the winnings in this slot tend to be quite petite. Players can win 10x their total bet if they land 5 Montezuma symbols on a payline, or they can win the same prize if they land 4 or 5 scatters on the reels. Of course, with a 10x multiplier, that figure can rise to 100x the normal rate of pay, which is much more like it. Montezuma is one of WMS Gaming’s legendary slot machines. Ever popular and commonly found across the internet, players should have few difficulties in getting to grips with what Montezuma has to offer. This game is cheap, it offers decent features, and only drawback is the rather petite non-progressive jackpot cash prizes that it carries.